Ellen Bryant Voigt is one of poetry’s sharpest minds—possibly the sharpest—when it comes to syntax. Her books The Flexible Lyric (2001) and The Art of Syntax: Rhythm of Thought, Rhythm of Song (2009) contain the kinds of essays that can leave your brain feeling too big for your head, discussions that gain resonance with subsequent readings. 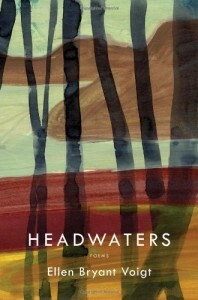 Much the same can be said of her newest collection of poetry, Headwaters. One might expect to get lost—perhaps in the enjambment of “I clung / to my own life raft,” or the placement of the prepositional phrase in “I’m doing better in this regard I try to do better,” or even in the aside “you’re not surprised”—but the reader is never left adrift because the syntax sets our course. If I have one piece of advice for you, it’s this: read these poems aloud. Spoken into the air, what might pass as stripped language—after all, even most of the titles are single words—comes fully to life, lush and vibrant, its echoing language and rhythms allowed to inhabit all the space they deserve. Ruth Foley lives in Massachusetts, where she teaches English for Wheaton College. Her recent work is appearing or forthcoming in Redheaded Stepchild, The Bellingham Review, Yemassee, and Sou’wester, among others, and her chapbook Dear Turquoise is available from Dancing Girl Press. She serves as Managing Editor for Cider Press Review. 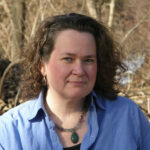 Visit Ruth Foley’s contributors page.